Chain brakes of power saws occasionally show differences in braking behavior, in regards to the duration of the braking process and its variation. 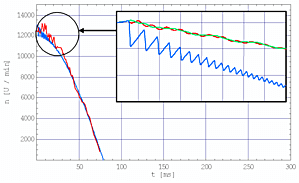 It was investigated which parameters mainly influence the duration of the braking process and its variation. Solutions of the dynamical equations are damped, non-linear vibrations for the lever mechanism. The tightening of the brake strap mainly causes the non-linearity. There exist two different types of solutions for the chain, which vary in quality: Shortly after the braking process is triggered, it is decided if only the coupling barrel and chain will be decelerated (→ short time-span for the braking process) or if the entire crank gear remains coupled to the coupling barrel until the rotational speed for uncoupling is reached (→ long time-span for the braking process). This bistable behavior is determined by several parameters. 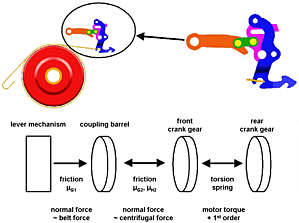 Besides the coefficients of friction, the geometric lever behaviors are also essential. Considering the prototype, the duration of the braking process, the variation of the braking process and the dynamic stresses on the components have been substantially reduced for the series machine by optimizing the geometry of the lever mechanism and the brake strap. 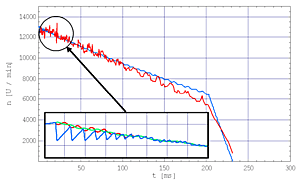 The lower two figures illustrate the comparison of the measured (red) and simulated (blue) speed behavior of the chain on the prototype and the series machine. The zoomed-in diagrams show the simulated behavior of the relevant degrees of freedom immediately after triggering the lever mechanism. Thus, the duration of the braking process for the series machines could be limited to 80 [ms]. Simulataneously the maximum stress was reduced by 20%.